On January 27th, People Power, an advocate for human-powered transportation in Santa Cruz County, hosted a walk along the rail corridor in Santa Cruz in response to recent threats by Union Pacific to fine “trespassers” up to $2,000. The walk in the rain, which brought out more than two dozen people, featured local historian Ross Gibson who included information on the past and possible future of rail transportation in Santa Cruz County. The Sunday stroll began at Swift Street on the Westside of Santa Cruz and ended at Bay Street. The Santa Cruz County Regional Transportation Commission (SCCRTC) has been in negotiations with Union Pacific Railroad (UP) for over three years to acquire the line. The SCCRTC has agreed to pay $19 million to UP for the Santa Cruz Branch (rail) Line. Once the local RTC takes ownership of the rail corridor the Santa Cruz County Friends of the Rail Trail hope to begin building segments of a rail trail, ultimately spanning the entire 31 miles from Davenport to Watsonville. Passenger trains and the coastal rail trail could run together along the coastal line to help students, commuters, and visitors to travel throughout the County. 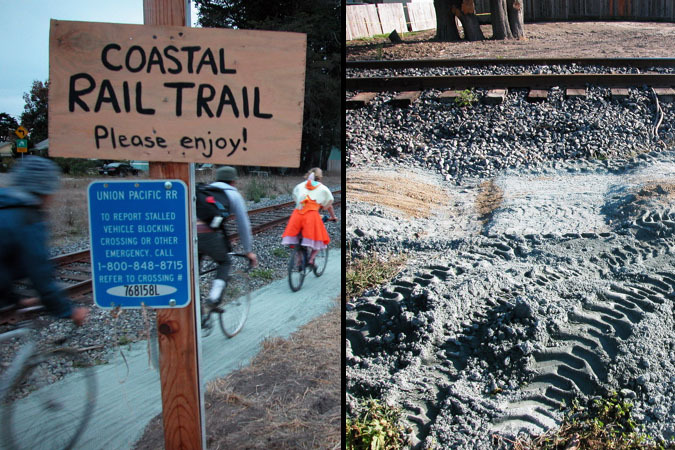 The Santa Cruz County Friends of the Rail Trail is a not for profit organization dedicated to the development of bicycle and pedestrian paths within rail corridors throughout Santa Cruz County. FORT members and volunteers build and maintain rail trails, inform and involve the public, and recommend best trail practices to government agencies. The article originally appeared in the San Jose Mercury News, July 19, 1994. I couldn’t find the article online anymore, but here’s a photo of President Roosevelt in Big Tree Grove. This article was first published in the Aptos Times, in the March 1996 and April 1, 1996 issues. Previous Previous post: Beat It! This is Our Parking Lot!